Free places to beat the heat and have some fun. Chinatown Stream along the Rose Fitzgerald Kennedy Greenway. 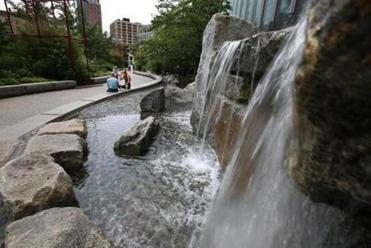 Boston’s Rose Fitzgerald Kennedy Greenway has seven water features, including the Rings Fountain in the Wharf District that lights up at night and the Chinatown Stream, a bubbling brook winding through a stand of bamboo near Essex Street. Work your way up or down the Greenway (stop near Chinatown if you want to picnic in the shade). Take public transit or visit on Sundays for free parking at nearby meters. Where: Rings Fountain, Atlantic Avenue and High Street, Boston; Chinatown Stream, Surface Road and Beach Street, Boston. Hours: 9 a.m. to 11 p.m. 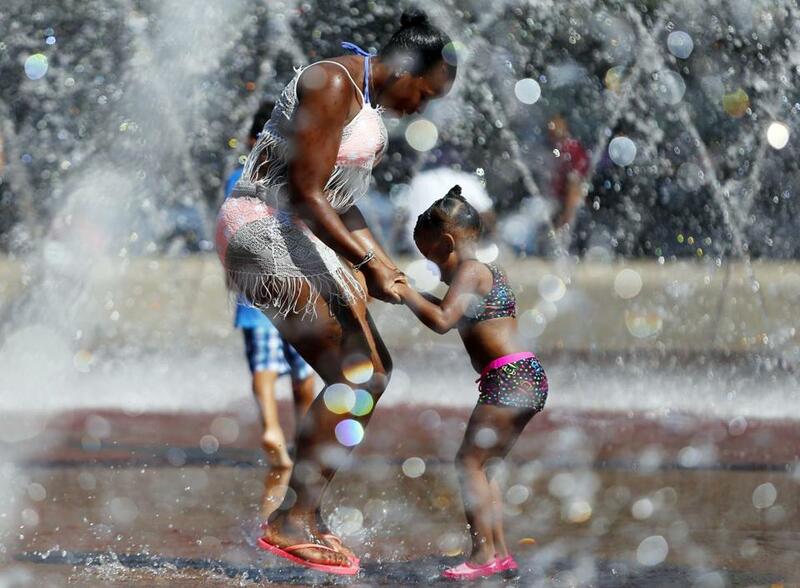 The Children’s Fountain on the Christian Science Plaza, with its majestic ring of jets, has been a Boston summer staple since 1975. Just around the corner, the recently renovated Edgerly Road Playground is a cozy neighborhood park with some shade, a lawn, and a hand-cranked spray feature kids love to control themselves. It’s easy to hit both spots on the same afternoon. The Children’s Fountain on the Christian Science Plaza. Where: Christian Science Plaza, 210 Massachusetts Avenue, Boston; Edgerly Road Playground, 6 Edgerly Road, Boston. 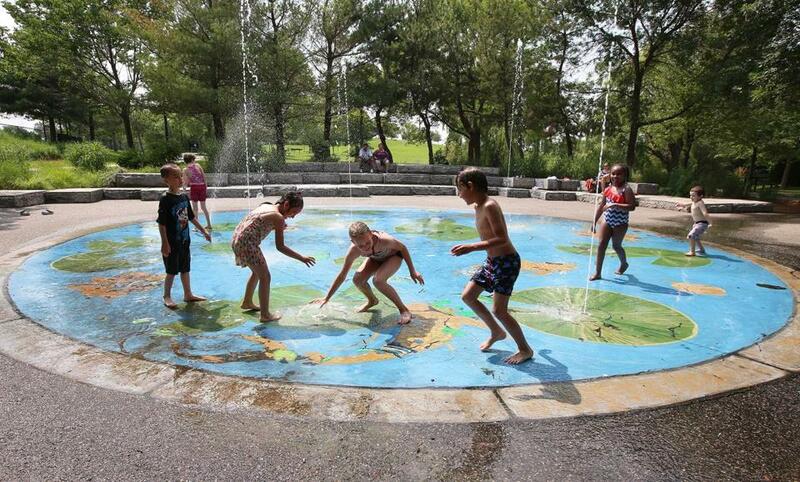 Hours: Plaza, 9 a.m. to 9 p.m.; Edgerly, 9 a.m. to 8 p.m.
Tucked into a corner of 50-acre Danehy Park in Cambridge is a lovely wading pool painted to look like a pond with jets that spray water over delighted kids’ heads. A relatively tranquil place for water fun, the rest of the park offers walking trails, multiple playgrounds, and picnic areas galore; there are also bathrooms and several free parking lots. Beaver Brook Reservation in Belmont. Older kids will love Belmont’s Beaver Brook Reservation spray deck, where there are real boulders to scramble over. Those may be too slippery for little ones — better to take them to play in the nearby tot lot. The park’s other amenities include bathrooms, a drinking fountain, picnic area, and a lawn that’s popular with dog owners. Some intrepid bathers try wading the old-fashioned way — by rolling up their pants and walking into nearby Beaver Brook. Hours: 9:30 a.m. to 7 p.m. The stunning Alexander W. Kemp Playground at Cambridge Common is worth a visit at any time of year, but in the summer the main attractions are a shower-like water feature and a pump wheel you can spin to send water running down a series of tables into the sand area (it’s the perfect place to make mud pies on a hot day). Where: Alexander W. Kemp Playground , Waterhouse Street and Massachusetts Avenue, Cambridge. The nautical theme of the Dorothy Curran Play Area at Moakley Park, located across the street from Carson Beach in South Boston, extends to the five towering water features that look like giant Dr. Seuss-drawn seaweed. Bonus: You can actually smell the ocean while you cool off, then run on the lawn or climb the ship-shaped play structure. Where: Moakley Park, 1005 Columbia Road, South Boston. 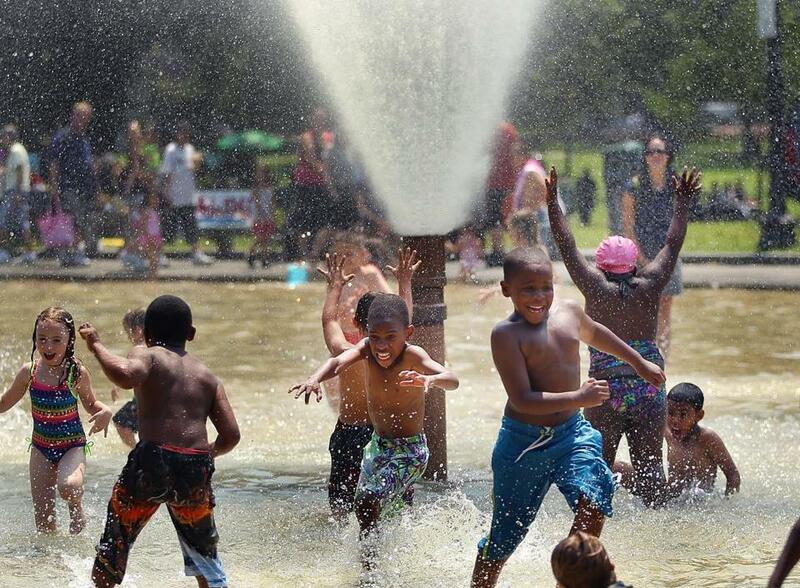 Hours: 9 a.m. to 8 p.m.
More like a full-fledged water park than a spray park, Mattapan’s Ryan Wading Pool and Playground includes a large wading pool that even big kids love (areas are 22 inches deep), as well as dozens of fun spray features, including ones shaped like a snake, turtle, and alligator and a structure with buckets that continuously fill up and dump out. The park also has bathrooms, limited free parking, a playground, and shade. It’s about a five-minute walk from the Red Line’s Mattapan Station. Where: Ryan Playground, 350 River Street, Mattapan. Southwest Corridor Park passes through several Boston neighborhoods, including Jamaica Plain, which is where you’ll find the Johnson Playground Spray Deck and the Stony Brook Spray Deck. At Johnson, there are separate splash areas for big and little kids, and Stony Brook is smaller but worth a visit for the gurgling fountain in the middle. Both are near Orange Line stations — Johnson is across from Green Street, and Stony Brook is across from the station with the same name. Where: Johnson Playground, corner of Lamartine and Green streets, Jamaica Plain; Stony Brook Spray Deck, corner of Lamartine and Boylston, Jamaica Plain. Hours: both 9:30 a.m. to 7 p.m.
Frog Pond on Boston Common. The most famous of Boston’s spray grounds, Frog Pond on Boston Common is an old-fashioned wading pool in summer with a fountain that sends water soaring 30 feet in the air. While you’re there, you can take a break from splashing about for a turn on the carousel ($3 per ride). There’s a cafe, plenty of picnic space, shade, and easy access to public transportation. Where: Frog Pond, 139 Tremont Street, Boston. Hours:11 a.m. to 6 p.m. most days; check bostonfrogpond.com. Views of the Charles River, the Zakim Bridge, and the Museum of Science make North Point Park in Cambridge a must for playground connoisseurs — add in the huge spray deck, play structures for kids of all ages, fields, paths, and picnic spots, and this hidden gem is one of the area’s best. There’s even a water fountain for furry visitors. Where: North Point Park, 6 Museum Way, Cambridge. Stephanie Tyburski is a frequent contributor to the Globe Magazine. Send comments to magazine@globe.com.